A rocking hello from the great Midwest! It’s Andy Gesner and the staff from HIP Video Promo bringing you another must see video! Strong musicianship and imagination are welcome traits in a metal band, but they aren’t strictly necessary. Many metal acts have made good careers mining a narrow territory, sticking to one subgenre, and spinning out minor variations on a well-established template. And then there are bands like Shadows Fall. The players in this Massachusetts quintet are talents supple enough to adapt to almost any metal format – and have the vision to locate the common ground between them. In their short history, Shadows Fall have played death metal, thrash metal, Goteborg melodic metal, and pure American hard rock; better yet, they’ve fused these styles into an amalgam that’s wholly their own. Thus, it’s no exaggeration to call Shadows Fall one of the most important and best-loved acts in modern metal: one impressive enough that fans and journalists outside of the tight circle of metal culture can’t help but notice and be impressed. Alternative Pressnumbered the quintet among the five best acts in contemporary metal. Meanwhile, Shadows Fall continues to reap accolades from the metal community: readers of Revolver Magazine voted the band “Best New Talent”, and MetalHammer bestowed the “Golden God Award” for Best Underground Group upon them. Almost every six-string slinger working in music dreams of getting ranked and profiled inGuitar World. The magazine rates both Jonathan Donais and Matt Bachand – the Shadows Fall front line – among the 100 Greatest Guitarists of All Time. Shadows Fall producer Nick Raskulinecz is a metal aficionado himself, but he’s also worked with Rush and the Foo Fighters, and knows how to coax the radio-friendly potential out of an uncompromising rock combo. On Threads Of Life, the band’s debut album for Atlantic Records, Raskulinecz and Shadows Fall continue to chase the perfect hybrid of thrash-metal fury and melodic intensity. Singer Brian Fair can shift at will from an authoritative roar to a tuneful Swedish-style wail – and the band is equally adept at tossing change-ups. With its fierce verse and soaring chorus, “Redemption”, the lead single, is a prime example of the group’s alchemy and newfound balance. 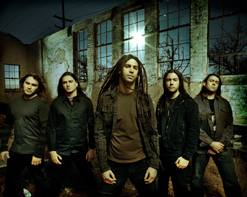 And it’s already setting the hard rock airwaves ablaze: “Redemption” hit #1 on Mediaguide’s survey of Metal Specialty Tracks, and Shadows Fall became one of the few heavy bands to be featured on MTV2’s The Drop. Shadows Fall has backed up their ambitious recordings with a scalding live show. They made their successful Ozzfest debut in 2003, and haven’t looked back since then; they were one of the undisputed highlights of the Headbanger’s Ball tour, and are currently joined by Lacuna Coil and Stone Sour on the Jagermeister Music Tour. The clip for “Redemption” – directed by Zach Merck (Hinder, Converge, Dropkick Murphys) contains plenty of footage of the musicians in action. They’ve set up on top of a city building, and they broadcast their riffs to the streets below. The musicians are imposing figures – especially singer Fair, who swings his massive dreadlocks in time with the music, heaves his chest, and bellows like a god of thunder unchained. Merck is no stranger to the band: he shot the clips for “Enlightened By The Cold” and “Inspiration On Demand”, two Shadows Fall singles released in 2005. He is fond of apocalyptic imagery and horror comic tone, and with the “Redemption” video, he takes these tropes to their logical conclusion. The clip is a live-action comic, featuring a mysterious cloaked woman, a blind Tiresias sketching in chalk on the city sidewalks, and a protagonist who must read the omens correctly in order to save the day. Merck uses a filter that occasionally makes his footage look hand-drawn; at these moments, we’re pulled into the pages of his comic, and his stark and desperate narrative achieves the grandeur of an animated painting. We are all very excited to once again be working with Diane Van Horn and Jason Pleskow at Atlantic Records to bring you this stellar rock clip! They have been kind enough to hook us up with copies of Threads Of Life for all of your on air giveaway needs. Don’t hesitate to be in touch if you would like a copy or if you would like to catch up with the band for a video interview on their current tour! If you need more info call Andy Gesner at 732-613-1779, or email HIPVideo@aol.com.